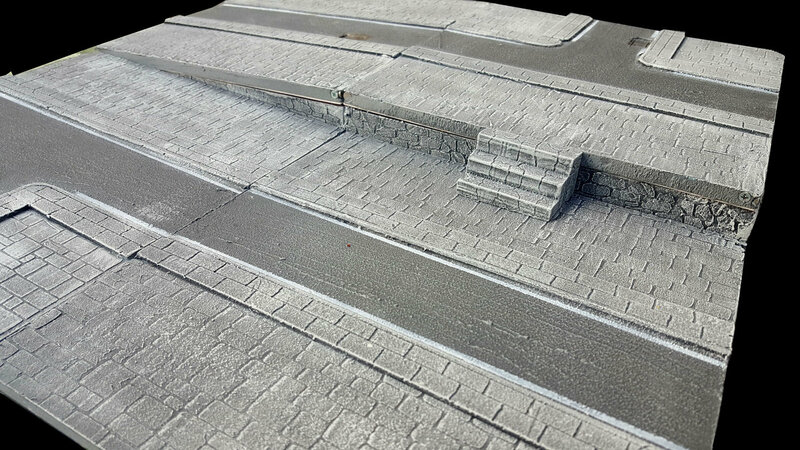 The Stone Stairs are made from resin and handpainted, and are intended to be used in combination with the Urban Rise Supports in all three Themes. Stairs' height is 3cm, exactly like the height difference between a standard tile and a raised one. The stairs are 7cm wide (so they can be even placed at "end" of a cobblestone road) and each step is 1cm high and 1.5cm deep. This is an add-on which works with the unlocked Urban Elevation System. When using the Urban Rise Support to raise your whole tiles by 3cm and create different levels, then it is imperative (at least for gaming reasons) to create access points to and from this higher rise. The main transit method to the higher level are sloped, uphill roads which you can form with the Urban Slope support - this is actually the only way for vehicles to climb up to the Rise. However, as it is common in many cities, rises are also connect by stairs.